The use of bookplates is almost as old as printing itself. They were used to record ownership and to reassure the owner that a borrowed book would be returned. The early designs were heraldic and engraved on copper, and then paper labels became a more popular and inexpensive choice. Various styles were used during certain periods, and this makes it possible to date most bookplates. The pride of ownership and the different styles of bookplates can be traced in this remarkable book. Considered to be one of the most beautiful medical books ever published, this copy of Vesalius’s work on anatomy has bookplates and signatures that document ownership for more than 350 years. The first owner, George Baker (“Ex Libris Georgio Baker 1570”), served as one of Queen Elizabeth I’s surgeons, and another owner, Thomas Wharton, was one of the few doctors who stayed and treated patients during the London plague of 1665. The last private owner was Joseph Lyon Miller, a Virginia physician and rare book collector. 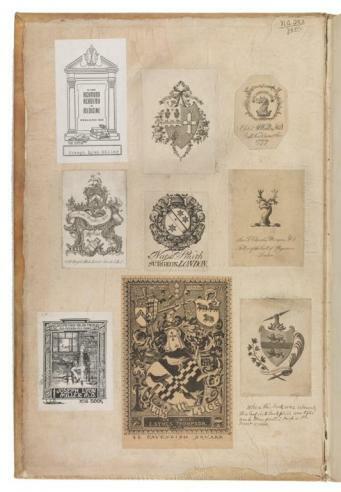 Many of the other bookplates shown here were donated by Beveley Randolph Wellford, a physician, collector, and officer of the Virginia Historical Society.